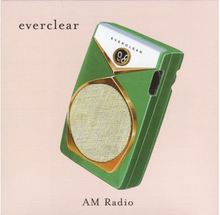 (2000) "When It All Goes Wrong Again"
"AM Radio" is a rock song by the band Everclear. The song was recorded c. 2000 for Everclear's fourth album Songs from an American Movie Vol. One: Learning How to Smile. The song was released as the second single from Everclear's album Songs from an American Movie Vol. One: Learning How to Smile. It failed to reach the Billboard Hot 100, getting to number one on the Bubbling Under Hot 100 Singles chart. The "AM Radio" single was mistaken by many to be the first single from Everclear's fifth album, Songs from an American Movie Vol. Two: Good Time for a Bad Attitude because the song was released so soon before Everclear's fifth album's release. The song was later used in a television commercial for General Motors in early 2006. The song's lyrics deal with Art Alexakis' memories of growing up during the 1970s— specifically mentioning the years 1970, 1972, 1975, and 1977—while listening to his favorite music on AM radio, which Alexakis describes in the outro chant as: "We like pop, we like soul, we like rock, but we never liked disco." The song begins with a 1970s vintage jingle from Los Angeles radio station KHJ and samples Jean Knight's song "Mr. Big Stuff". It also contains a short sample of "Those Were the Days", the theme song of the American sitcom All in the Family. However, certain versions of the song, including the version on later pressings of Songs from an American Movie Vol. One: Learning How to Smile omit the sample. The lyrics make reference to several items of 1970s nostalgia: the Ford Pinto, 8-track tapes, the classic television shows Good Times and Chico and the Man, and the band Led Zeppelin (in 1977, the song's characters would have been listening to the album Presence). The song was used as a tribute to AM Radio Top 40 by John Records Landecker to open his Memorial Day show on the 2008 WLS (AM) "Big 89 Rewind". WLS in Chicago was one of the leading AM giants in Top 40 radio from the 1960s to August 23, 1989, when it dropped music for all talk. The music video starts off with a radio announcer reading the recorded programming disclaimer (the voice of KHJ newsman Art Kevin) from the KHJ sample, without the jingle. It then shows the band, along with some extra brass players, performing in front of a giant screen. At first, the screen shows a bunch of smileys. As the first verse begins, the screen starts showing TV programs (i.e., The Brady Bunch, Kojak, Hawaii Five-O, H.R. Pufnstuf, Sigmund and the Sea Monsters, Adam-12, Land of the Lost) with Art Alexakis' face edited onto some of the characters to make them sing with the song, or other well-known people, events and styles from the 1970s (i.e., Richard Nixon resigning, Jimmy Page, platform shoes). A few scenes actually have members of Everclear doing 1970s things (i.e., posing in leisure suits, getting high in a Volkswagen Bus). Art Alexakis is wearing a Portland Trail Blazers jersey in honor of that city's professional basketball team. Greg Eklund is wearing a Los Angeles Lakers jersey. Camp Chaos Entertainment also created an animated cartoon version of the music video in SWF format. "The Man Who Broke His Own Heart"
This page was last edited on 5 January 2019, at 23:28 (UTC).